KUALA LUMPUR: The ASEAN Para Games 2017 (APG) drew down its curtain with style as host Malaysia finished second with their best ever outing at the biennial event in eight years with 90 gold, 85 silver and 84 bronze medals. Kuala Lumpur bid farewell as host of the 9th APG at the National Stadium in Bukit Jalil here tonight with Deputy Prime Minister Datuk Seri Dr Ahmad Zahid Hamidi declaring the games closed and joining thousands of spectators, athletes and officials from 11 countries who took part in the largest sporting event in Southeast Asia, held from Sept 17 to 23. Indonesia was crowned as the overall champion with 126 gold, 75 silver and 50 bronze medals. 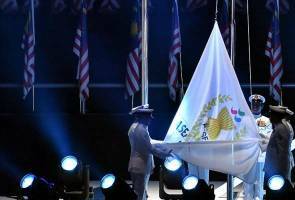 Although Malaysia failed to hit the 103-gold target, the athletes showed high spirit as they fought tooth and nail in their quest to emulate the normal athletes who had emerged as the overall champion in the 2017 Kuala Lumpur SEA Games last month. Third-placed Thailand collected 68 gold, followed by Vietnam with 40, the Philippines 20, Myanmar 11, Singapore 10 while Brunei and Timor-Leste ended two gold each respectively but Cambodia flew home with five silver and five bronze and Laos managed four silver and four bronze medals. The 10th edition of the Games will be hosted by the Philippines in 2019. "I declare close the 9th ASEAN Para Games Kuala Lumpur 2017," a beaming Zahid said when closing the APG2017 to cheers and applause from those who had packed into the 100,000-capacity stadium at 9.15 pm here tonight. The glorious closing ceremony, broadcast live nationwide and beyond, was also attended by former Malaysian Prime Minister Tun Abdullah Ahmad Badawi and his wife Tun Jeane Abdullah who is also the Patron of Malaysian Paralympic Council (MPC), Youth and Sports Minister Khairy Jamaluddin, President of ASEAN Para Sports Federation (APSF) Maj. Gen. Osoth Bhavilai, and MPC president SM Nasarudin SM Nasimuddin. For one week the eyes of the Southeast Asia had been on Kuala Lumpur as APG was the third edition hosted by Malaysia after 2001 and 2009. The contributions of the thousands of APG volunteers, famously known as the WAU Factor were also acknowledged at the closing ceremony. Malaysia also handed over the APG hosting duties to the Philippines which was marked by the handing over of the SEA Games Federation (SEAGF) flag to Michael Barredo, President of the Philippines Paralympic Commitee-National Sports Association for the Differently-Abled. The extinguishing of the APG flame provided a poignant moment for the over 1,421 athletes and officials involved in 368 events across 16 sports featured in the APG which carried the theme 'Rising Together'. Tonight's proceedings were enlivened by songs, dances, cultural performances and special appearance of Malaysian born and internationally renowned singer-songwriter, Yunalis Zarai who is better known as Yuna.